Shhhhh (but not really)….Eduardo is on the way! | Anthony Pearson, Author. Just a small, quick (but exciting) update. I’m so proud to announce that this fall, my next picture book Eduardo Guadardo, Elite Sheep will be published! 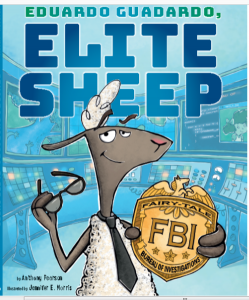 Jennifer Morris did an amazing job illustrating the story of secret agent sheep and his adventure with the Fairy Tale Bureau of Investigations. It was a blast to write, but soon you all can have fun reading it!